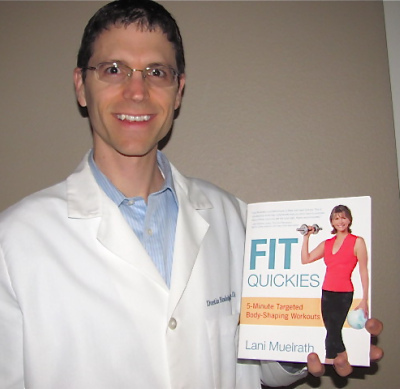 Note: Today’s guest author Dustin Rudolph, PharmD., is throwing a Fit Quickies book giveaway contest on the Pursue a Health You Blog. Click on the image below to enter. Looking to lose weight? Many people are given the current state of our waistlines in America. Nobody wants to find themselves in the official “overweight” or “obese” category after they weigh in at their next doctor’s office visit. At least I’ve never heard of anyone bragging about this. Have you? Shedding those extra pounds is becoming more than just about looking better on the outside. It’s quickly becoming about what’s happening on the inside as more and more scientific literature comes out linking those extra pounds to diabetes, heart disease, cancer, and more. So if losing weight is so important to so many then why is it that so many people find themselves in the same predicament year after year? I believe it’s because most of us are bombarded with advertisements, gimmicks, and misleading information when it comes to the food we eat. By getting back to the basics and gaining an understanding of the fundamentals on how foods affect the body you can empower yourself to achieve the long term, successful weight loss you’ve always wanted. But it’s going to take an open mind, willingness to learn, and most importantly a commitment to changing your every day habits. You already have the desire, now all you need is the right information to get you up and running. So what is the recipe for success when it comes to losing weight and keeping it off? 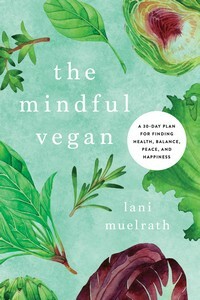 • The typical western diet consists heavily of meat and dairy which are both relatively high in their respect to fat content compared with the predominant foods of a low fat, whole foods, plant-based diet. These include vegetables, fruits, whole grains, and starches. • The 2010 Dietary Guidelines for Americans recommend that 20-35% of your total calories can be obtained from fat, which is similar to the National Cholesterol Education Panel (NCEP) guidelines of 25-35% of calories from fat. The problem with these recommendations is they don’t work. In fact, a study compared long term weight loss results over a period of two years with individuals who followed either a plant-based diet or a “low-fat” NCEP diet. The individuals on the plant-based diet lost nearly 3 times as much weight after 1 year than those on the NCEP diet and nearly 4 times as much weight after 2 years . • Another study found that adopting a low fat, plant-based diet was associated with significant weight loss in overweight women even without putting any restrictions on total calories or portion sizes . • Plant-based diets that focus on eating health promoting foods (fruits, vegetables, whole grains, and legumes) typically contain less than 20% of their total calories from fat. Plant-based foods that are an exception to this are nuts, seeds, olives, and avocados. Keep your intake of these to a minimum. 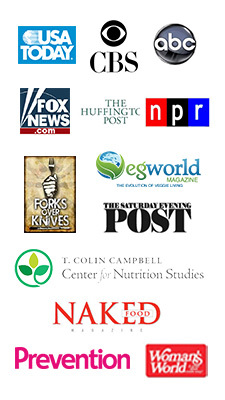 Dr. John McDougall and Dr. Caldwell Esselstyn  have both had enormous success with their patients on this type of diet by keeping the overall fat consumption to around 10% of total calories consumed. • You also want to keep your consumption or use of oils to a minimum and this includes olive oil and canola oil. Oils are 100% fat no matter how you look at it and they do not promote weight loss or overall health. One tablespoonful of oil (any oil) equals 120 calories, all derived from fat. • Fiber plays a crucial role in your diet by adding bulk to your stool and absorbing large amounts of water which helps you feel full and decreases the likelihood of you overeating. • Fiber acts like “nature’s broom” gathering up all the toxins and undesirable substances in your gut, such as cholesterol, as it moves through your digestive tract. Since fiber is not absorbed by your body these substances are excreted in your waste products. 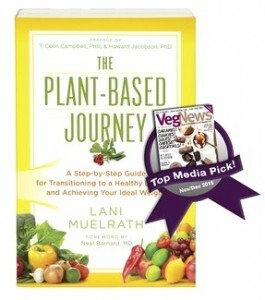 • Fiber is only found in plant-based foods (fruits, vegetables, legumes, whole grains, etc.) and is completely absent in animal-based foods (meat, dairy, eggs). • In a study of middle aged women there was a 49% reduction in risk of major weight gain in those who had a high-fiber diet compared to those who consumed a low-fiber diet . 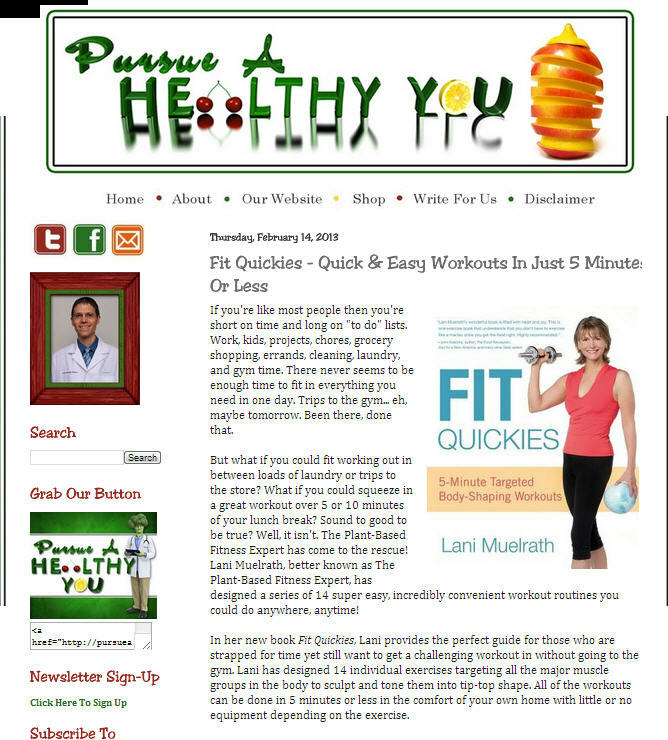 • Individuals consuming a low fat, high-fiber diet lost over 4 times as much weight as those eating a high fat, low-fiber diet after a 3 year follow up period in another study . • You’ve probably seen or heard that high carbohydrate diets are bad for you and will increase your overall weight, but this is only true when a majority of your carbohydrates have been refined. Refined carbohydrates are made when the food manufacturers take a complex carbohydrate such as whole wheat bread or brown rice and strip all the beneficial nutrients and fiber out of it leaving you with nutrient deficient calories. • Complex carbohydrates include beans, split peas, vegetables, lentils, and whole grains. • Your body prefers carbohydrates as it’s primary source of energy. When carbohydrates are consumed as whole foods they do not readily get stored as body fat which reduces your incidence of weight gain. • In fact, high carbohydrate diets reduced the likelihood of developing obesity compared to high fat diets . In order to get the biggest bang for your buck when it comes to weight loss you need to understand how different foods affect your body. Fad diets will come and go but a basic understanding of food will put you at the head of the class when it comes to losing weight, keeping it off, and improving your overall health. My advice to others is when they focus on their overall health through proper nutrition choices then the weight will take care of itself. What’s the point of losing 20 lbs in two months if it isn’t sustainable and worse yet puts your overall health at risk? This is often the case when trying diets such as the Atkin’s diet or South Beach diet. The scientific world has already proven through multiple studies over several years that the safest and most effective way to lose weight and keep it off is to adopt a low fat, whole foods, plant-based diet. This dietary pattern should be low in refined sugars and limit or avoid all animal-based foods. You just can’t go wrong with this approach. If you don’t believe it then I challenge you to give it a try for 3 months and see for yourself the benefits of adopting this eating style. You’ll lose weight, gain health, and feel much better! 1 Turner-McGrievy GM, Barnard ND, Scialli AR. A two-year randomized weight loss trial comparing a vegan diet to a more moderate low-fat diet. Obesity (Silver Spring). 2007 Sep;15(9):2276-81. 2 Barnard ND, Scialli AR, Turner-McGrievy G, Lanou AJ, Glass J. The effects of a low-fat, plant-based dietary intervention on body weight, metabolism, and insulin sensitivity. Am J Med. 2005 Sep;118(9):991-7. 3 Esselstyn CB Jr, Ellis SG, Medendorp SV, Crowe TD. A strategy to arrest and reverse coronary artery disease: a 5-year longitudinal study of a single physician’s practice. J Fam Pract. 1995 Dec;41(6):560-8. 4 Liu S, Willett WC, Manson JE, Hu FB, Rosner B, Colditz G. Relation between changes in intakes of dietary fiber and grain products and changes in weight and development of obesity among middle-aged women. Am J Clin Nutr. 2003 Nov;78(5):920-7. 5 Lindström J, Peltonen M, Eriksson JG, Louheranta A, Fogelholm M, Uusitupa M, Tuomilehto J. High-fibre, low-fat diet predicts long-term weight loss and decreased type 2 diabetes risk: the Finnish Diabetes Prevention Study. Diabetologia. 2006 May;49(5):912-20. 6 Hellerstein, M.K., Christiansen, M., Kaempfer, S. et al (1991). Measurement of de novo hepatic lipogenesis in humans using stable isotopes. J. Clin. Invest. 87: 1841-1852. 7 World Health Organisation (1998) Obesity – preventing and managing the global epidemic. Report of the WHO consultation on obesity. Geneva, June 97. 8 Fung TT, van Dam RM, Hankinson SE, et al. Low-Carbohydrate Diets and All-Cause and Cause-Specific Mortality. Ann Int Med 2010;153(5):289-298. 9 St. Jeor S, Howard BV, Prewitt TE, et al. Dietary protein and weight reduction: a statement for healthcare professionals from the Nutrition Committee of the Council on Nutrition, Physical Activity, and Metabolism of the American Heart Association. Circulation 2001 Oct 9;104(15):1869-74. Anna, didn’t Dustin do an amazing job? Great reference point for the basics – and backed up with all kinds of references. Thanks for popping in and leaving a comment today! I have a question, though. After being an unhealthy vegetarian/vegan for 13 years, I full committed to the low-fat plant-based lifestyle mid-December. I have 1.5 quarts full of green smoothie everyday (typically half for breakfast and half post-gym in the evening) and these have helped me so much. I enjoy them and find them satiating, so I’m not starving all day. Typically for lunch, I’ll have a combo of potato/salad/soup, a snack of homemade banana bread (or something similar) with a bit of almond butter before the gym, and then some veggies, rice, and beans after the gym (along with the rest of my green smoothie). And the scale has only bounced around within a couple of pounds in those 2+ months. Overall, I am doing this for better health, yes, but that goes hand-in-hand with weight loss when you have a substantial amount to lose! I have been struggling with what route to take at this point. I was really hoping that sticking to a low-fat, plant-based diet without having to count calories/carbs/etc. would do the trick for me, but I’m not sure what I’m doing wrong. Any advice would be appreciated!